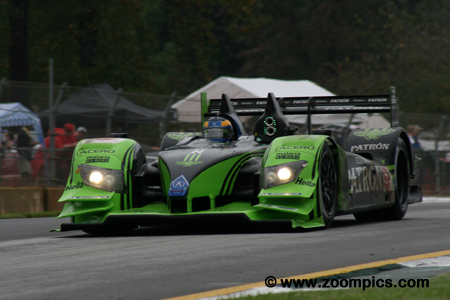 2009 was the eleventh season of the American Le Mans Series (ALMS). Initially, the ALMS classes and rules were the aligned with those used by the Automobile Club de l’Ouest at the 24 Hour of Le Mans. Beginning in 2009, changes were made to the classes participating in the series. There were five categories competing for class honours. Le Mans Prototype 1 (LMP1) – These are the purpose built race cars powered by a 6.0-liter normally aspirated or 4.0-liter turbocharged engine. The cars can weigh no less than 924-kilograms (approximately 2,040-pounds). Teams enter cars such as the Lola B06/10, Acura ARX 02a and Ginetta Zytek GZ09HS. Also competing in the series at selected events are the factory supported diesel-powered Audi R15 TDI and Peugeot 908 HDI FAP. These cars are powered by a wide range of engines producing between 600-700 horsepower. Le Mans Prototype 2 (LMP2) – LMP675 class was introduced in 2001 for vehicles which could weigh no less than 675-kilograms. 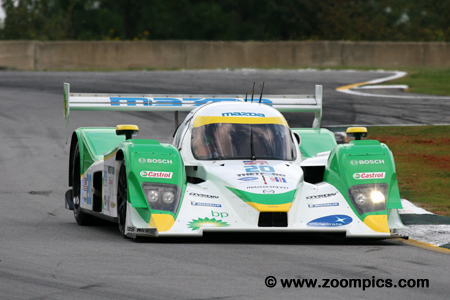 In 2004, this class was renamed LMP2 and the minimum weight was set at 775-kilograms (approximately 1,708-pounds). The rules are written so that the two LMP classes (LMP1 and LMP2) can contend for the overall win. Manufacturers producing cars for this class include Lola and Acura. 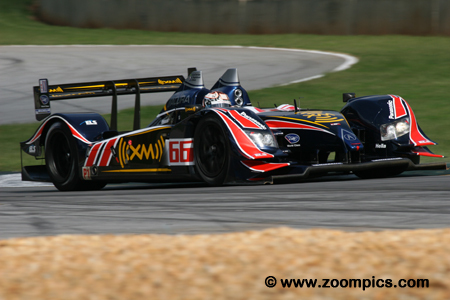 LMP2 cars use smaller engines producing between 500-550 horsepower. Grand Touring 1 (GT1) – 2009 would be the last year for the GT1 category. This class includes production-based vehicles such as the Chevrolet Corvette C6-R and Aston Martin DBR9. The cars are permitted to use 8.0-liter normally aspirated or 4.0-liter turbocharged engines which produce between 600-650 horsepower and can weigh no less than 1,125-kilograms (approximately 2,480-pounds). Grand Touring 2 (GT2) – The GT2 cars are also restricted to a 1,125-kilogram weight rule and have similar engine limitations as the GT1 class. These are also production-based machines which include vehicles such as the BMW M3, Porsche GT3 RSR, Panoz Esperante GT-LM, Ford GT-R, Dodge Viper Competition Coupe, Chevrolet Corvette C6.R and Ferrari F430 GT. Grand Touring Challenge (GTC) – The GTC class in new for 2009 and these teams will only be invited to compete at certain events. This category is a spec class for Porsche GT3 Cup cars. The 2009 ALMS schedule included ten North American events. The season kicked off with the 57th edition of 12 Hours of Sebring. After Sebring, the series competed on temporary street circuits at St. Petersburg, Florida and Long Beach, California. The opening rounds were followed by races at Miller Motorsport Park, Lime Rock Park, Mid-Ohio, Road America and Mosport Park. 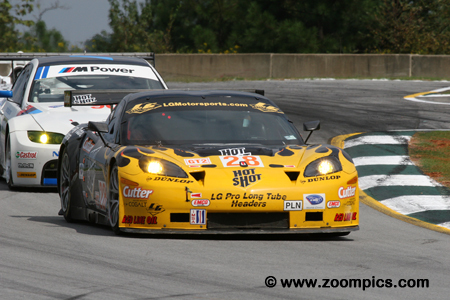 The season concluded with Petit Le Mans held at Road Atlanta and the finale at Mazda Raceway Laguna Seca. 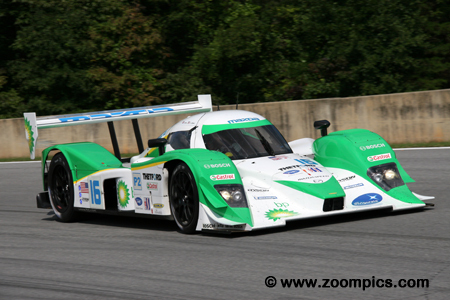 Round nine of the 2009 American Le Mans Series was held at Road Atlanta. 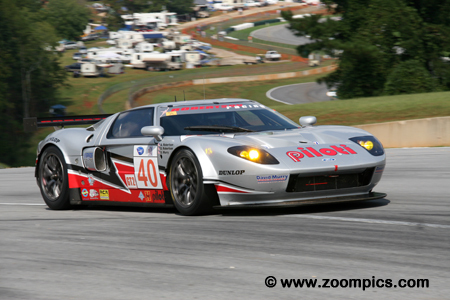 Teams would be competing in the twelfth annual running of Petit Le Mans. The race was ten hours or 1,000-miles (394 laps) - whichever came first - on the twelve-turn 2.54-mile road course. The Atlanta area had experienced heavy rains in the week leading up to the event but the weather was sunny and dry during practice and qualifying. Unfortunately, all indications were that rain would return for the contest on Saturday. The race started in wet conditions but the track dried early in the event. Later in the day the rain returned and intensified – causing race officials displayed the red flag. The Peugeots qualified on the front row. The No. 08 entry driven by Franck Montagny and Stephane Sarrazin was just 0.223-seconds slower than the pole-sitter. The team started the wet race with a dry setup and were passed by the two Audis. They were able to remain in contention and when the leading Audi spun during a caution period, the Peugeots moved into first and second. When the red flag ended the race, Montagny and Sarrazin were declared the winners. Qualifying twenty-second overall and tenth in GT2 was the No. 62 Ferrari F430 GT co-driven by Mika Salo, Pierre Kaffer and Jaime Melo. At the start of the race, the Ferrari ran with the GT2 front runners. When the heavy rains moved in during the fifth hour, the team made a timely pit stop just before the event was red-flagged. This proved to be fortuitous as it gave the Ferrari a one-lap advantage over the rest of the GT2 field and the class win. Shocking series regulars in qualifying was the performance of the Robertson Racing Ford GT-R. David Murry drove the Ford faster than any of the GT2 factory supported efforts. However, in the damp conditions, he was passed by the Corvette of Oliver Gavin, the Porsches of Wolf Henzler and Patrick Long and Jaime Melo in a Ferrari. Murry and his co-drivers – David and Andrea Robertson would finish tenth in GT2. The LMP2 contest could be described as ‘survival of the fittest.’ The No. 20 Dyson Racing Lola B09/86 was hampered by gear selection problems early in the event. But their competition had far more challenges. 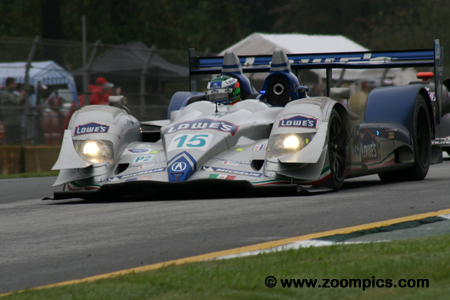 The team captured their first Petit Le Mans LMP2 win with drivers - Marino Franchitti, Butch Leitzinger and Ben Devlin. They finished well down the order in thirteenth place but were eight positions ahead of the next car in their class. 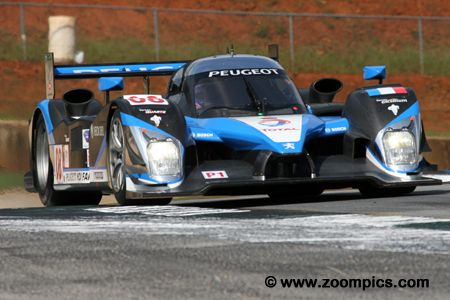 In 2008, Peugeot lost Petit Le Mans by a narrow margin to the Audi team. The team started the event by putting both Peugeots on the front row. The No. 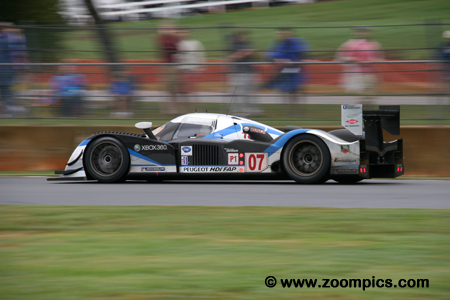 07 Peugeot 908 HDI FAP, driven by Pedro Lamy and Nicolas Minassian was the faster of the two cars. A poor choice for the race setup resulted in the Peugeots running behind the Audis. However, they moved to the top spots when the leading Audi spun. When the race was called the No. 07 was second. The second biggest surprise in qualifying belonged to Lou Gigliotti’s team. Tom Sutherland was second fastest at the conclusion of the GT2 session. Unfortunately, early in the race, Sutherland went off course and damaged the car which took the team out of contention. Sharing the LG Motorsports Chevrolet Corvette with Sutherland were Matt Bell and Tomy Drissi. The team was sixteenth overall and eighth in class when the race ended. During the Thursday afternoon practice session, Scott Sharp had a huge accident in turn three. The Patron Highcroft team with the help of de Ferran Motorsports were able to rebuild the Acura ARX-02a in less than 24 hours. The car was ready for the morning warm-up and started from the back of the grid. Sharp and his co-drivers, David Brabham and Dario Franchitti finished four laps behind the winners – sixth overall and in the LMP1 class. 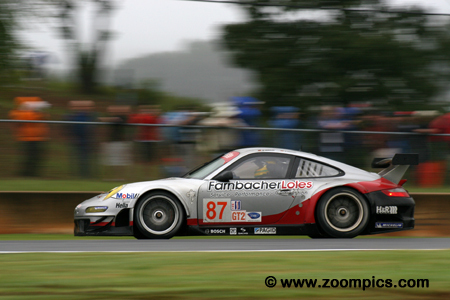 The Farnbacher Loles Racing Porsche GT3 RSR was driven by Wolf Henzler and Dirk Werner. The pair started in twenty-first grid position – ninth in GT2. Some smart driving by Henzler allowed the Porsche to move into third. Just before the race was red-flagged, the team had a quick pit-stop that kept them ahead of the No. 4 Corvette and allowed them to maintain third place in class. They captured the final spot on the podium when the race was called. 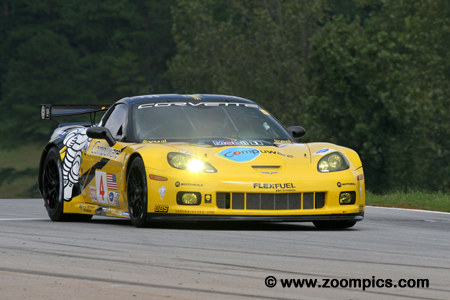 Quickest of the two Corvette Racing entries was the No. 4 Chevrolet Corvette C6.R shared by Oliver Gavin, Marcel Fassler and Olivier Beretta. They started fifteenth overall and third in class. The two Corvettes ran first and second at the beginning of the event. Pit-stops shuffled the order and when the race was red flagged and ultimately terminated, the Corvettes were fourth (No.4) and sixth (No.3) in the GT2 class. The Peugeots qualified on the front row but it did not take long for the third fastest qualifier, Allan McNish to take the lead. McNish and his co-driver Dindo Capello dominated the race. Unfortunately, McNish spun the No. 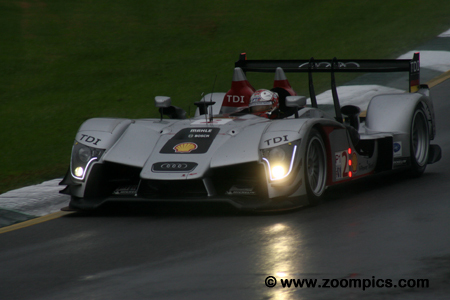 2 Audi R15 TDI during a caution period which allowed the two Peugeots to move back out front. Shortly after his spin, officials stopped the race and when the decision was made not to restart the event the pair had to settle for third. At the beginning of the contest, the de Ferran Motorsports group had a reason to be optimistic. Team principal, Gil de Ferran was keeping pace with the faster diesels but an incident in corner ten with the Lola of Jon Field required a long stop to repair the suspension. Scott Dixon drove the next stint but went off course and hit a wall. These factors contributed to a ninth place finish in LMP1 for drivers - de Ferren, Dixon and Simon Pagenaud. BMW Rahal Letterman Racing entered two BMW M3s. Driving the No. 92 BMW was Tommy Milner, Dirk Muller and Jorg Muller. 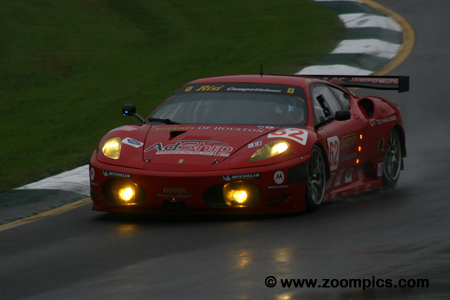 The car started sixteenth overall and fourth in the GT2 category. The second BMW fell out of contention when it suffered radiator damage. The Milner/Muller/Muller BMW was second in class when heavy rains forced race officials to stop the event. The No. 1 Audi R15 TDI was shared by Lucas Luhr and Marco Werner. The Audi started in the fourth position on the grid. At the beginning of the race the two Audis passed the Peugeots and after pit-stops, Werner led laps 40-43. When the race was red flagged and eventually stopped, the No. 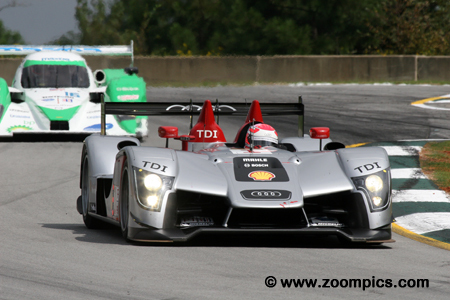 1 Audi was in fourth place overall and the LMP1 class – one lap behind the race leaders. The Lowe's Fernandez Racing Acura ARX- 01b was driven by Adrian Fernandez and Luis Diaz. 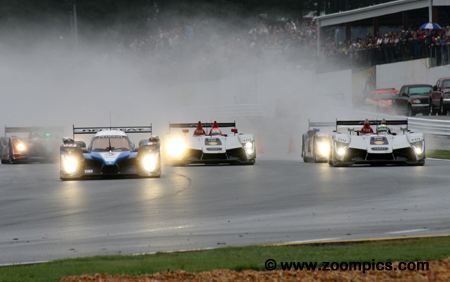 In the early going, the Acura was very competitive and led the LMP2 category. Unfortunately, for the team, the car developed steering issues which took them out of contention. When the red flag was displayed – ultimately ending the contest – they were twenty-first overall and a distant second in the LMP2 class. A number of cars started from the pit-lane - one of them was the Team Cytosport Porsche RS Spyder driven by Klaus Graf and Sascha Maassen. Graf drove the first stint and chased down the LMP2 leader Marino Franchitti. However, he switched to dry tires too early and spun off course which may have contributed to the engine cutting out. The two drivers soldiered on and were twenty-second overall and third in class when the red flag was displayed. The second Dyson entry used a new butanol bio-fuel from BP - as a result, they were placed in the ‘unclassified alternative fuel category’. Biobutanol offers many advantages – reduced carbon emissions, blends better with gasoline and requires no vehicle modifications. The No. 16 Mazda-powered Lola B09/86 was driven by Chris Dyson and Guy Smith. The team proved to be very competitive finishing seventh overall.